Guidelines have been compiled by The Joint Tuberculosis Committee of the British Thoracic Society to quantify the risks of reactivation of tuberculosis with anti-tumour necrosis factor α (anti-TNF-α) treatment. These guidelines are intended to inform respiratory physicians, gastroenterologists, rheumatologists and dermatologists, together with specialist nurses in those disciplines. In view of the increased risk of reactivation of tuberculosis (TB) with anti-tumour necrosis factor α (anti-TNF-α) treatment, various professional groups have sought the advice of the Joint Tuberculosis Committee of the British Thoracic Society. The objectives of these guidelines are to quantify these risks and to give advice on the treatment of TB disease and infection in patients being assessed for anti-TNF-α treatment. The risks and benefits of treatment for latent TB infection in those unsuitable for tuberculin skin testing are also covered. These guidelines are intended to inform respiratory physicians, gastroenterologists, rheumatologists and dermatologists, together with specialist nurses in those disciplines. The format follows that used for other BTS guidelines. At the start there is a summary of the abstracted bullet points from each section. Following that there is an algorithm summarising the management of patients due to start anti-TNF-α treatment (fig 1). The recommendations use the revised Scottish Intercollegiate Guidelines Network (SIGN) grading system available at http://www.sign.ac.uk/guidelines/fulltext/50/section6.html (table 1). The primary source literature has been individually graded for its methodology (where appropriate) and the grading is given alongside the reference using the revised SIGN levels of evidence (table 2). 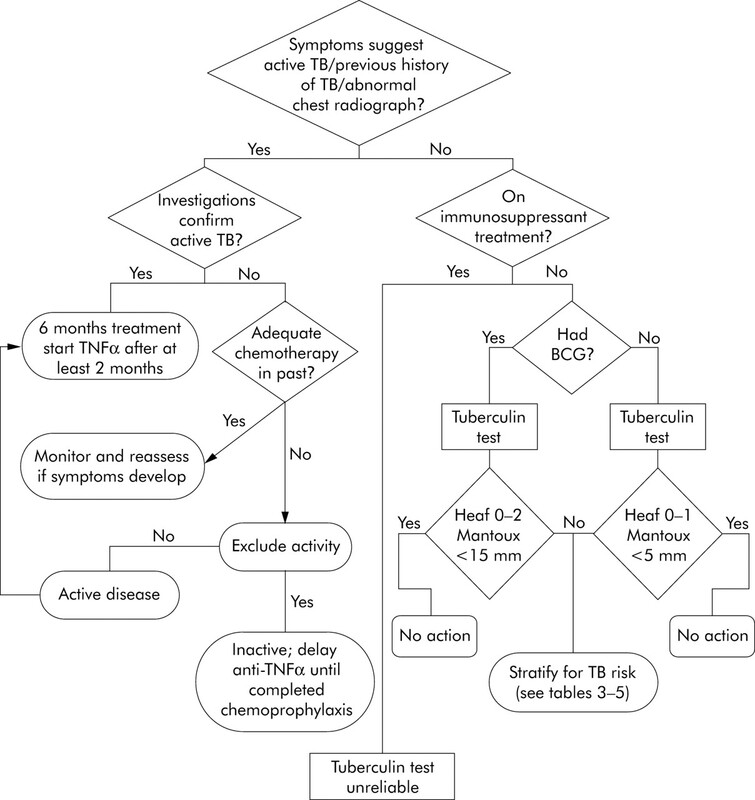 Algorithm for management of TB in patients scheduled for anti-TNF-α treatment. Notes for algorithm Mantoux equivalence for Heaf tests: 0–5 mm induration = Heaf grade 0–1; 6–14 mm induration = Heaf grade 2: ⩾15 mm induration = Heaf grade 3–4. Where the tuberculin test is unreliable, this should not be performed and patients should be stratified for TB risk (see tables 3–5). Give chemoprophylaxis if TB risk (tables 3–5) greater than chemoprophylaxis (table 6). In general, black Africans aged over 15 and all South Asians born outside the UK should be considered for chemoprophylaxis with isoniazid for 6 months (6H). If the risk from chemoprophylaxis is greater than the TB risk, repeat the chest radiograph within 3 months of starting anti-TNF treatment/investigate if required. All patients on TB treatment or prophylaxis should be managed by a thoracic or infectious disease physician. Clinical awareness of the possibility of TB should be maintained throughout anti-TNF treatment and for a period up to 6 months after cessation of anti-TNF treatment. The initial systematic literature search (Pubmed, EMBASE) was carried out by one of the committee (LPO) using tuberculosis and biologics 1997–2003 and chemoprophylaxis for TB and hepatitis 1966–2002 as search criteria. A paper based exploration of the relevant literature was pursued from this core dataset. Only English language literature including clinical trials and all well formulated clinical case series were included. Isolated case reports and abstracts were excluded. In patients receiving anti-TNF-α treatment there is an increased risk of clinical tuberculosis (TB) developing. For those with a normal chest radiograph who are on immunosuppressive therapy, a tuberculin test will not be helpful and need not be undertaken. An individual risk assessment should be made (tables 3–5); if the annual risk of TB is greater than the risk of drug induced hepatitis, then chemoprophylaxis should be given. (C) If the risk of hepatitis is greater, the patient should be monitored regularly with suggestive symptoms promptly investigated to permit early diagnosis of active disease. An algorithm is supplied. (C) In general, black African patients aged over 15 years and all South Asians born outside the UK should be considered for chemoprophylaxis with isoniazid for 6 months (6H). All members of the Guideline Committee were asked to submit a written record of possible conflicts of interest to the Standards of Care Committee of the BTS. None were recorded. The Guidelines Committee suggest that the guidelines should be reviewed in summer 2008. The increase in active TB associated with anti-TNF treatment has led to a requirement to screen for active and latent TB in patients before anti-TNF-α treatment is given. This screening, suggested by manufacturers to include tuberculin skin testing, is further complicated by the fact that many patients—up to 79% in the infliximab study1—were receiving immunosuppressive therapy such as maintenance prednisolone, azathioprine, 6-mercaptopurine, methotrexate, cyclophosphamide, ciclosporine, tacrolimus, or mycophenolate mofetil which would interfere with the accuracy of tuberculin skin testing.2,3 The product licence for infliximab states that the product should be used in conjunction with methotrexate or other immunosuppressants, and in practice the other anti-TNF agents would also normally be used with other immunosuppressants. Chemoprophylaxis or preventive treatment for TB itself carries a small risk, with drug induced hepatitis being the main issue, increasing with age and occasionally fatal. It is also important to exclude active TB disease before chemoprophylaxis is given, particularly as single agent chemoprophylaxis given when active disease is present could lead to the development of drug resistance. These problems have led to many requests for advice in this area. Post-marketing surveillance in the USA and beyond to the end of May 2001 showed 70 cases of TB associated with infliximab use and a much lower number of cases with etanercept.1 Cases of TB have also been described with adalimumab.8 The majority of the cases of TB in patients given infliximab occurred within three cycles of treatment, with a median of 12 weeks after commencing treatment.7 The frequency of tuberculosis was much higher than other opportunist infections reported with the drug, and was higher than reported background rates.9 Over 50% of reported TB cases associated with anti-TNF-α treatment are extrapulmonary.9 The number of cases of TB reported to the US Food and Drugs Administration had risen to 117 by December 2001, giving a recalculated TB prevalence of 41/100 000 in infliximab/etanercept treated patients in the USA with rheumatoid arthritis, 9/100 000 in patients in the USA with Crohn’s disease, and 224/100 000 in all non-USA patients with rheumatoid arthritis or Crohn’s disease.10 The number of TB cases now reported has reached 242 (Keane J, personal communication, 2004), but the curve has levelled off due to either improved TB risk assessment, tuberculin testing and isoniazid prophylaxis, and/or reporting fatigue. The incidence of TB varies markedly within the United Kingdom (UK) according to a number of factors.12,13 These are age, ethnic group and, for those not born in the UK, the length of time since first entry. Where possible, data on the current annual risk of TB have been updated from those derived from continuous enhanced surveillance (tables 3–5). If white and UK born, use data from table 3. If Indian subcontinent (ISC), use table 4. If black African, use table 3 (similar data to table 4 not yet available). If either white, non-UK born, or other ethnic group, use “All patient rate” in table 4. If in doubt or in special circumstances, consult local thoracic physician. A database search (Medline and Embase) was carried out on the reported hepatotoxicity of antituberculosis chemoprophylaxis from 1966 to 2002 in adults. Children were excluded because they have a very low rate of drug reactions, and studies in HIV positive individuals were excluded because such individuals have a higher than normal drug reaction profile.14 The hepatitis rates for various regimens were derived from these data (table 6). Only hepatitis sufficient to stop treatment (symptomatic) or grade 3 alanine transferase (ALT 5–20 times normal) or grade 4 (ALT >20 times normal) hepatitis is reported here. According to the manufacturers, the use of anti-TNF treatment is contraindicated if there is co-infection with HIV, hepatitis B or C, so this guidance does not apply to patients with these co-infections. If the calculated annual risk on anti-TNF treatment is higher than the risk of hepatitis, then the risk-benefit analysis favours chemoprophylaxis; if lower, the risk-benefit calculation favours observation and investigation of symptoms. Table 5 gives some worked examples. (C) In general, black Africans aged over 15 years and all South Asians born outside the UK should be considered for chemoprophylaxis with isoniazid for 6 months (6H). Suggested audit criteria are as follows. Keane J, Gershon S, Wise RP, et al. Tuberculosis associated with infliximab, a tumor necrosis factor-alpha neutralizing agent. N Engl J Med2001;345:1098–104 (II). Joint Committee on Vaccination and Immunisation. Tuberculin testing. In: Vaccination and immunisation. London: HMSO, 1996; Chapter 32. Mow WS, Abreu-Martin MT, Papadakis KA, et al. High incidence of anergy in inflammatory bowel disease patients limits the usefulness of PPD screening before infliximab therapy. Clin Gastroenterol Hepatol2004;2:309–13. Schuna AA, Megeff C. New drugs for the treatment of rheumatoid arthritis. Am J Health Syst Pharm2000;57:225–34. Kornbluth A. Infliximab approved for use in Crohn’s disease: a report on the FDAGI Advisory Committee Conference. Inflamm Bowel Dis1998;4:328–9. Choy EHS, Punayi GS. Cytokine pathways and joint inflammation in rheumatoid arthritis. N Engl J Med2001;344:907–16. Weinblatt ME, Keystone EC, Furst DE, et al. Adalimumab, a fully human anti-tumour necrosis factor alpha monoclonal antibody, for the treatment of rheumatoid arthritis in patients taking concomitant methotrexate: the ARMADA trial. Arthritis Rheum2003;48:855. Anon. HUMIRA prescribing information. North Chicago, IL: Abbott Laboratories, 2002. Gardam MA, Keystone EC, Menzies R, et al. Anti-tumour necrosis factor agents and tuberculosis risk: mechanisms of action and clinical management. Lancet Infect Dis2003;3:148–55. Keane J, Gershon SK, Braun MM. Tuberculosis and treatment with infliximab. N Engl J Med2002;346:625–6 (II). Wolfe F, Michaud K, Anderson J, et al. Tuberculosis infection with rheumatoid arthritis and the effect of infliximab therapy. Arthritis Rheum2004;50:372–9 (II). Kumar D, Watson JM, Charlett A, et al. Tuberculosis in England and Wales in 1993: results of a national survey. Thorax1997;52:1060–7 (II). Rose AMC, Watson JM, Graham C, et al. Tuberculosis at the end of the 20th century in England and Wales: results of a national survey in 1998. Thorax2001;56:173–9 (II). Pozniak A, Miller R, Ormerod LP. Treatment of tuberculosis in HIV-infected patients. AIDS1999;13:435–45. Joint Tuberculosis Committee of the British Thoracic Society. Chemotherapy and management of tuberculosis: recommendations 1998. Thorax1998;53:536–45 (I). International Union against Tuberculosis Committee on Prophylaxis. Efficacy of various durations of isoniazid preventive therapy for tuberculosis: five years of follow-up in the IUAT trial. Bull WHO1982;60:555–64 (I). American Thoracic Society and Centers for Disease Control and Prevention. Targeted tuberculin testing and treatment of latent tuberculosis infection. Am J Respir Crit Care Med2000;161:S221–47 (II). Centers for Disease Control. Fatal and severe hepatitis associated with rifampin and pyrazinamide for the treatment of latent tuberculosis infection—New York and Georgia, 2000. MMWR Morbidity Mortality Weekly Report2001;50:289–91 (II). Centers for Disease Control. Update: Fatal and severe liver injuries associated with rifampin and pyrazinamide for latent tuberculosis infection, and revisions in the American Thoracic Society/CDC recommendations—United States 2001. MMWR Morbidity Mortality Weekly Report2001;50:733–5 (II). Joint Tuberculosis Committee of the British Thoracic Society. Control and prevention of tuberculosis: recommendations 2000. Thorax2000;55:887–901 (II). Jasmer RM, Saukkonen JJ, Blumberg HM, et al. Short-course rifampin and pyrazinamide compared with isoniazid for latent tuberculosis infection: a multicenter clinical trial. Ann Intern Med2002;137:640–7 (I). Nolan CM, Goldberg SV, Buskin SE. Hepatotoxicity associated with isoniazid preventive therapy: a seven year survey from a public health tuberculosis clinic. JAMA1999;281:1014–8 (II). Bailey WC, Taylor SL, Dascomb HE, et al. Disturbed hepatic function during isoniazid chemoprophylaxis. Am Rev Respir Dis1973;107:523–9 (II). Hong Kong Chest Service, Tuberculosis Research Centre Madras, and British Medical Research Council. A double-blind placebo-controlled clinical trial of three antituberculosis chemoprophylaxis regimens in patients with silicosis in Hong Kong. Am Rev Respir Dis1992;145:36–41 (I). Lee AM, Mennone JZ, Jones RC, Paul WS. Risk factors for hepatotoxicity associated with rifampin and pyrazinamide for the treatment of latent tuberculosis infection: experience from three public health tuberculosis clinics. Int J Tuberc Lung Dis2002;6:995–1000 (II). Stout JE, Engemann JJ, Cheng AC, et al. Safety of two months rifampin and pyrazinamide for treatment of latent tuberculosis. Am J Respir Crit Care Med2003;167:824–7 (II). Smieja MJ, Marchetti CA, Cook DJ, et al. Isoniazid for preventing tuberculosis in non-HIV infected persons (Cochrane Review). In: The Cochrane Library. Issue 2 2004;(I). ↵* Members of the BTS Standards of Care Subcommittee: L P Ormerod (Chair)1, H J Milburn2, S Gillespie3, J Ledingham4, D Rampton5.